#G0649* – Are Sheep More Stupid Than Humans? In a pretty strong argument that sheep really do follow blindly, hundreds of sheep followed each other over a cliff in Turkey in 2005. 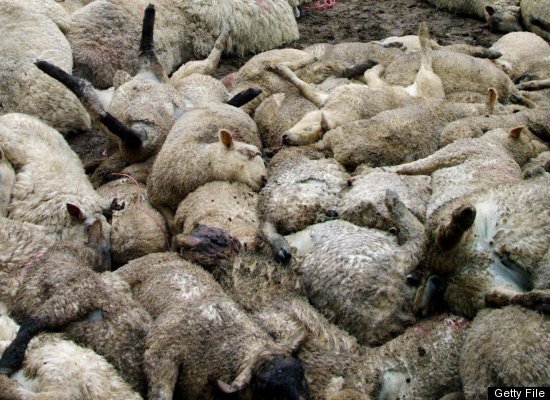 According to the BBC, 400 sheep died, but another 1,100 falling sheep survived the pileup due to bodies cushioning their 15-meter fall. The mass “sheep suicide” devastated villagers in the eastern Van province, as families had relied heavily on their sheep for survival. USA Today suggests that it was an estimated loss of $100,000. What we want to know is, if all the sheep were following each other blindly, which stupid sheep was leading them all? Just consider we as humans CHOOSE polirticians to lead us and just look at the mess they make of almost everything they touch – primarily spending more than they extort in taxation – in fact spending more by many factors than it would be possible to obtain in taxation. This idiotic economic iliteracy, whatever the obfuscating linguistics is a common madness, seemingly common to all politicians as they spend some 80% of their time and effort spending OUR money to get themselves re-elected be that to cover up their incompetence or in such ignorance as to be willing to exacerbate the mess they have made! Sheep seem t6o act instinxctivly with little reasoned choice where humans claim intelligent thought as they appoint politicians to lead them ever deeper into chaos! The EU is a classic example iof this stupidity amongst mankind!